As the Father has loved me, so have I loved you. Now remain in my love“… You did not choose me, but I chose you and appointed you so that you might go and bear fruit—fruit that will last—and so that whatever you ask in my name the Father will give you (John 15:9,16 NIV). Do you understand the weight of this verse? God chose you; He keeps choosing you no matter what you say or do. You can’t stop His incredible love. In fact, the more you try to resist or deny God’s love, the more He will pursue your heart. You won’t ever feel the true weight of God’s love by doing all of the right things in life, or by trying to live up to some perfect religious standards. The only way we can truly understand how much the Savior adores us is to realize how awful our sin is and how far we have fallen. And you know what? We don’t have to try to impress God with our religiosity or good works in order to show we love Him. The only way to truly love God is to surrender our lives to His love, and to let Him have His way in our lives. The effects of the fall of man are still obvious today. But through it all, God decided to choose us. He chose you, even in those moments when you wouldn’t have chosen yourself. 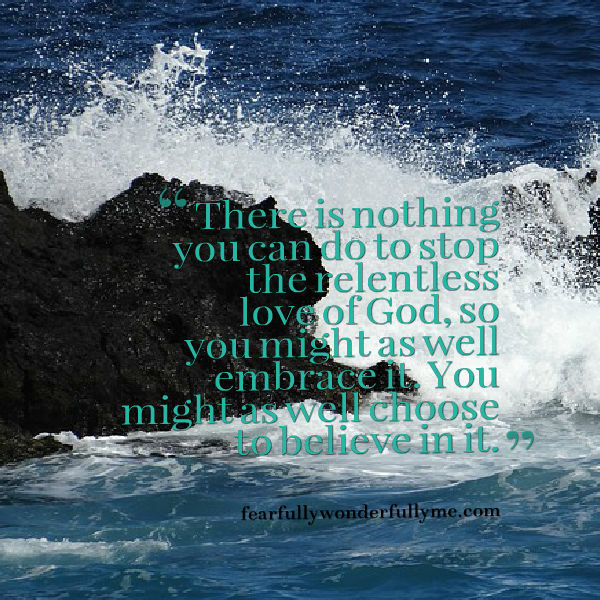 There is nothing you can do to stop the relentless love of God, so you might as well embrace it. You might as well choose to believe in it. Closing in to end the chase. Then begins Your steady race. “Let go; let Me!” the Hunter calls. Stubborn Love has set the pace. As we run from Love’s embrace. Forced to hear Love face to Face. First, your sins; then hurts . . . rejection . . . .
Our retreat could not erase. Catch your hand and plant His kiss. Thanks for reminding us that we are chosen because we are loved. It’s too much to comprehend!